Office Process Templates for Excel (FastStart Office Pack) is a collection of templates designed to tackle the most common office tasks and organize your business processes. These basic spreadsheet forms make any business or office run more smoothly! 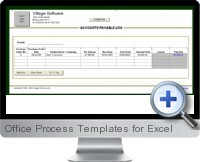 The Office Process Templates for Excel targets the most common office tasks. The Client Conversation Log lets you track your time spent with clients. The Mail Log helps you keep track of mail sent and received at your office - it's a mini-mail room even for the smallest business. The Office Supply Request Sheet and the Office Inventory Log help you track all your business' expendable assets. Office Process Templates for Excel also includes a set of handy employee forms. The Employee Information Form helps you track and record all the vital information on your company's workers. The I-9 Form, important to fill out in today's increasingly international environment, records the citizenship status of new employees. The Weekly Employee Scheduling Form and Employee Vacation Schedule help you figure out work schedules and keep your office covered.